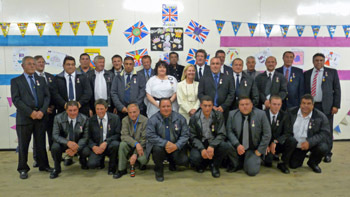 News from the Tristan da Cunha Government for 2009 to 2012, including the Governor, the Resident Administrator, Chief Islander and Tristan-related official events in the UK and abroad. The presentations of the Queen’s Diamond Jubilee Medals were made by Administrator Sean Burns during a Reception in the Prince Philip Hall on Wednesday 26th September 2012. The medals were awarded to members of the British Armed Forces, Emergency Services and Prison Service who have completed five years of satisfactory service, and the award is given by Her Majesty the Queen as a mark of thanks to all those who give so much in the name of society and public service. The Tristan award ceremony was postponed owing to the tragic beach accident which claimed the life of Islander Barry Swain over the Diamond Jubilee weekend. and Clive Glass and Jerry Green who were ill. I am pleased to report that we have finally reached an agreement with the owners/insurers of the MS Oliva, the bulk carrier that ran aground at Nightingale Island on 16 March 2011. The details of the settlement are a commercial matter between the vessels owners/insurers and the Tristan Government but we are satisfied that the settlement represents a reasonable and fair deal for us to move forward with the management of the fishery and protection of the environment. In the meantime the fishery at Nightingale remains closed and the quota at Inaccessible has been reduced to 44 tonnes. These are provisional quotas that will be reviewed at a meeting of fishery experts in Cape Town in November. James Glass, our Fisheries Director will be attending on Tristan’s behalf. The Conservation Department will shortly begin the penguin counts around the islands and further details will be posted just as soon as they become available. The long awaited White Paper on the UK Overseas Territories was published on 28th June. There follows a Foreign and Commonwealth Office Press Release and there is a link below to the UK Government's FCO website where the White Paper can be downloaded. 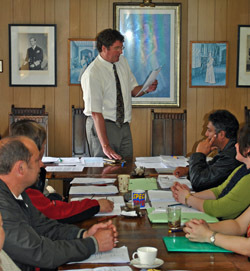 It includes a photograph of Tristan da Cunha Chief Islander Ian Lavarello during the 2011 Overseas Territories Consultative Council in London. The UK Government renews and strengthens Britain’s relationship with the Overseas Territories today with the publication of its White Paper, “The Overseas Territories: Security, Success and Sustainability”. “Today’s White Paper is the first review of the Overseas Territories since 1999 and it demonstrates the importance the Coalition Government attaches to the Overseas Territories. “As well as having a responsibility to ensure the security and good governance of the Territories, we want the Territories to be vibrant, flourishing communities that proudly retain aspects of their British identity. This White Paper focuses on three goals: strengthening engagement between the UK and the Territories; working with the Territories to strengthen good governance, public financial management and economic planning where this is necessary; and improving the quality and range of support available to the Territories. The White Paper was developed across government departments and in consultation with the people and governments of the Territories. In the year in which Britain and the Territories celebrate the Diamond Jubilee of Her Majesty The Queen, it sends an important signal of long-term engagement. The Overseas Territories are incredibly diverse; they include thousands of small islands, vast areas of ocean, but also, in Antarctica, land six times the size of the United Kingdom. They include one of the world’s richest communities, in Bermuda; and the most remote community, in Tristan da Cunha. They are internationally recognised for their exceptionally rich and varied natural environments. They are home to an estimated 90% of the biodiversity found within the UK and the Territories combined and include two of the world’s largest Marine Protected Areas. We are delighted to announce that HM Queen Elizabeth II has awarded Joe Green an MBE in the Birthday Honours list announced on 16th June 2012. Joseph Gordon Green, Mechanic and voluntary worker, Tristan da Cunha. For services to the community in Tristan da Cunha. We recently published details of Joe's last job before retirement on our Inshore Shipping page. Administrator Sean Burns sent a message to Joe, presently en route to Cape Town with his wife Anne aboard MV Edinburgh passing on warm congratulations for the work he has done (much of it unpaid) for over 40 years for the whole community. On 18th June Governor Mark Capes wrote to Joe sending his warmest congratulations on being honoured with an MBE in recognition of his dedicated and valuable contribution to the community of Tristan da Cunha. The Governor also looks forward to meeting Joe when he is able to visit Tristan. Administrator Sean Burns returned aboard MV Edinburgh on Friday 8th June 2012. Also on board was new doctor Rajaram Patil taking over from Dr Tom Day. Administrator Sean Burns departed Tristan on 19th March 2012 aboard the cruise ship National Geographic Explorer, first travelling to Cape Town, then for a holiday in Kenya before returning to UK in May. During Sean's absence Chief Executive Officer Kobus Potgieter was sworn in as Acting Administrator during a ceremony in the Council Chamber. While back in the UK I was able to catch up with a number of UK stake holders including Tristan Association President and Chairman Michael Swales and Website Manager and Newsletter Editor Richard Grundy. We talked about a number of issues including the Education Trust Fund and other joint ventures. I also spent time with DfID who continue to provide support to Tristan in the medical and education sectors as well as our infrastructure (harbour and funding of the PWD director slot) and training. I also spent time with colleagues in the FCO to review the Strategic Plan and with NiCo to review the work they do with us in the health sector. It was also good to catch up with our UK Representative Chris Bates who we were also pleased to be with on the Agulhas voyage. Kobus Potgeiter, our new Chief Executive Officer arrived in July. The position is DfID funded and Kobus is here to help with the government reform programme with a focus on procurement, finances and budgeting, structure and performance evaluation. Kobus has made a great start and we all look forward to working very closely with Kobus over the coming months. Jim McIntosh, a botanist, arrived in early October. Jim is here on an OTEP (FCO/DfID funded) project, the Tristan Baseline Vegetation Survey. Jim will be working with the conservation team. This is an exciting and challenging project and I am sure that once he has settled in Jim will be able to post something on the website and tell readers more about the project and what he hopes to achieve. We had identified a new director but sadly he did not take up the offer. We will be interviewing in the next few weeks and hope to have a new Director in post by January. The fishery on Inaccessible is open for a limited tonnage pending decisions we need to take following work we are doing with our experts, on the impact the Oliva has had on the fishing grounds there. Nightingale remains closed pending further surveys and test fishing (which has so far been poor). The main worry continues to be what impact there has been on the juvenile lobsters and therefore, recruitment in to the fishery in future years. We are working very closely with our experts, Ovenstone and the owners/insurers to try and establish this and what we need to do to counter this. Work is progressing on this. As you will appreciate, this is a complex area and needless to say, as always, we need to adopt a cautious approach to protect our most valuable resource. 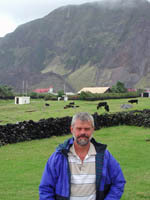 I write as the Chief Islander of Tristan da Cunha, the most remote inhabited island in the world, to convey our condolences and the deepest sympathies of everyone, after the bombings in Oslo and fatal shootings on Utøya Island. These terrible events have caused much distress on Tristan da Cunha, as we treasure our links with Norway, which have been so important over the years and crucial to our development. It was a Norwegian scientific team which carried out the first geological survey of our island before World War II and those links – scientific, cultural and personal – continue to this day. Our island museum helps to tell the story of what is to us, a very special friendship. The Tristan Island Council would like you to know (and to convey to Oslo) that everyone on our island remembers the people of Norway in their hearts and their prayers at this time of great sadness and mourning. What happened in Oslo and Utøya on 22nd July was an act of appalling barbarism. Like the Norwegian people, we on Tristan value our freedom of spirit and know that their courage, decency and resilience will help them overcome this evil. by Administrator Sean Burns on 7th June 2011 prior for Sean's departure on a working leave. and will initially spend about a fortnight in South Africa before travelling to the UK by the end of June. then travelling on to Kenya in August before later returning to Tristan. We are delighted to announce that HM Queen Elizabeth II has awarded the Tristan Government Treasurer Lorraine Repetto an MBE for services to the community of Tristan da Cunha in the New Year's Honours List published on 31st December 2010 in the London Gazette. Governor Gurr will be presenting former Chief Islander Conrad Glass with his MBE awarded in June 2010 during his visit to Tristan aboard RMS St Helena in February, but Lorraine's award will not be available at this time. 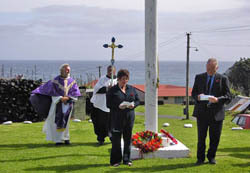 Lorraine is shown left giving a Eulogy during a Remembrance ceremony in 2008 and is also a member of the Island Council. Congratulations to Lorraine and the Tristan community she represents. 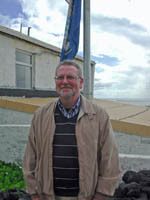 Sean Burns arrived on Tristan aboard SA Agulhas on 9th September 2010. A 'Meet the new Admin. party' was held in the new Post Office and Tourism Centre for Island Councillors, Heads of Department with their partners and other visitors and expatriates on 11th September. 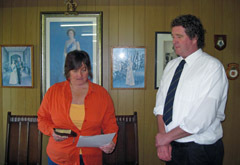 Sean was sworn in as Administrator in a ceremony during an Island Council meeting held on 15th September. See also : the Administrator Page (for a profile of Sean Burns) and the Community News Page for pictures of the 11th September party. Administrator David Morley and his wife Jacki arrived aboard MV Baltic Trader from Cape Town on Sunday 4th October after what he described as an 'unpleasant trip'. 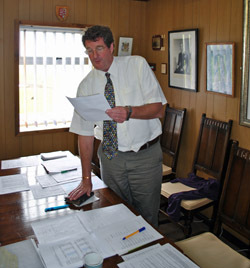 David starts his final year as Tristan da Cunha Administrator, taking over the helm from Acting Administrator and Chief Islander Conrad Glass who has been in charge since 17th July. David understands that the FCO will be interviewing potential candidates to take up the Tristan Administration post from September 2010 in the week beginning 12th October. Tristan's Chief Islander,Conrad Glass with his wife Sharon left Tristan aboard SA Agulhas on 7th October, en route to England. Conrad will embark on further police training with the Bedfordshire force, and also attend the annual Overseas Territories Consultative Conference in London 17th-19th October. 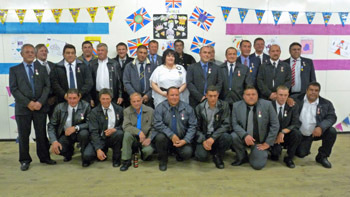 Tristan da Cunha has enhanced its international status by virtue of its new constitutional title. Formerly part of the UK's Overseas Territory of St Helena and Dependencies, the Overseas Territory will now be called St Helena, Ascension and Tristan da Cunha. Even though the Territory's Governor will be resident on St Helena, the new constitution gives equal weight to detailed provisions for Tristan da Cunha, which encompass a bill of rights for its citizens. 'This is a very important step for the people of Tristan da Cunha. The Council and I feel honoured to have been given the responsibility to participate in making this decision. At a time when there are many changes taking place in our society, Tristanians are comforted knowing at last they have a constitution that protects our human rights, while governing our way of life. 'The UK has worked openly and constructively with the Councils on the three islands to ensure that the new Constitution will serve those islands well in the future. The previous constitution came into operation in 1988 and reflects a very different world. The new Constitution, on the other hand, is one fit for the 21st Century. For the first time it includes a bill of rights; it also introduces a number of important limits on the Governor's power; and there will be separate chapters for the three islands allowing for far greater clarity about the respective roles of the institutions on the three islands. It represents the kind of modern partnership that we seek with all our Overseas Territories. and Tristan in Parliament Page for further details and a link to the full transcript. Chief islander Conrad Glass was sworn in as Acting Administrator on 17th July 2009, prior to Administrator David Morley's departure on leave aboard MV Edinburgh on 19th July. Like every other Overseas Territory, the Tristan Government has been reviewing its readiness to deal with the threat posed by swine flu. At the moment we judge the risk to be low, but The Medical Officer and I will continue to take every measure we judge appropriate in order to protect the community's health. This year's visit by the Agulhas will need careful consideration. All passengers should check with us nearer the time to see if any special measures have been introduced. More generally, everyone planning to visit Tristan should be aware that our MO checks passenger health before authorising them to disembark from their ship. The worst case scenario is that anyone who is ill. and is judged to carry a risk to the community will be required to stay aboard the ship. More specific advice and guidance will be available nearer the time of the Agulhas' departure. The Baltic Trader (presently anchored off the Settlement) contains aggregate for the new buildings' foundations, which are due to be completed by the end of the year. Unfortunately this will have to stay on the Trader as she needs a bit of help with ballasting problems so the aggregate will have to stay aboard for the return trip. But this should not cause any delays as we get it back later this year. Tristan now has a draft 7-year Strategic Development Plan. Thanks to great work by visiting consultant Julian Morris, the Island Council was able to put this together itself. A consultation process is now under way, and the Plan should be complete well before the end of the year. Steven Catchpole is our latest consultant. Steven is here to review the public service structure and processes for effectiveness, efficiency, affordability and capacity. His recommendations will result in streamlined and improved performance and service delivery in line with best value principles. I imagine it will take a little while to make the changes, which will be reflected in the Strategic Development Plan. Right : Photo from David Morley shows Steven outside the Government Building. South African Henning Myburg has been appointed as Head of the Tristan Public Works Department. An experienced marine engineer and qualified diver, Henning has spent many years working for the South African Police Service (SAPS) where he has gained solid experience on anti poaching work as well as a range of marine and nautical projects. 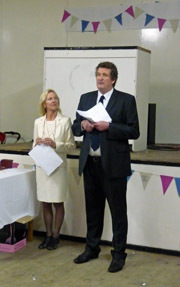 Henning will take up his appointment in August, accompanied by his wife Linda. The season is over and tourism looks like being Tristan's success story this year. We are on track to hit £100,000 of tourism revenue. Not all of this will accrue to Government, but overall this is a great result for the community. Partly due to kind weather but also because of the implementation of a sound and practical strategy. Rob Harrison, Tristan Desk Officer, will visit (aboard the MV Edinburgh) for familiarisation purposes. Rob is the first visitor from the FCO since 2007. 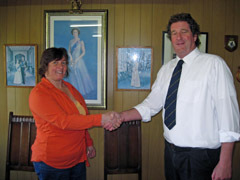 Mr Andrew Gurr, accompanied by his wife Jean, will visit Tristan in January 2010, aboard the RFA Wave Ruler. The first visit by the Governor since 2006. Mr Gurr is likely to be accompanied by a senior official from the UK Department for International Development (DfID). David himself will have a well-deserved leave from July-September. Connie Glass will as usual be Acting Administrator. The planned visits of St Helena Governor Andrew Gurr and Attorney General Ken Baddon, (see reports below) have been postponed. The last visit by a St Helena Governor was by Mike Clancy who helped mark the 500th Anniversary of the discovery of the island when he visited on the Tristan Association RMS St Helena Cruise in February 2006. There has never been a visit to Tristan by a serving Attorney General. The planning of regular St Helena - Tristan da Cunha visits have been made more difficult as annual trips from St Helena by the RMS St Helena, started in 1985, were curtailed after the 2004 journey. 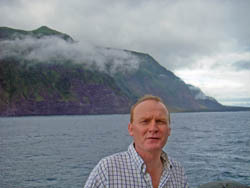 Mike Clancey travelled aboard the RMS St Helena on the special 2006 Quincentenary Cruise to Tristan organised by the Tristan da Cunha Association. The Association has been trying to commission a similar cruise, but unfortunately the RMS St Helena has been unavailable. The European Union has earmarked 16.63 million Euros, which amounts to more than £15.5 million, at the current exchange rate, from the European Development Fund for St Helena and its Dependencies. St Helena , Ascension and Tristan have received EDF funding in the past, but this is the largest amount of money they have been awarded at any one time. Dr Corinda Essex, Chief Development Officer, described this as excellent news. For St Helena , this will allow for the crucial development of a safer landing facility (including breakwater, slip way and sheltered landing area) and improved sea defences in James Bay . It will also provide funds for major road rehabilitation and the establishment of a preventative road maintenance programme. Ascension Island will benefit from road upgrading, and monies will be awarded to Tristan da Cunha for further harbour improvements; investigation of alternative energy potential; upgrading of water, waste management and electricity distribution infrastructure; and capacity building relating to the management of the lobster industry. St Helena was the first of all Overseas Territories to submit its detailed 130+ page bid for funding and the Development and Economic Planning Department was congratulated by the EU on the quality of this document. The bid will now be looked at by various officials in the EU before final approval is given to release the funding. It is expected that funding will become available in 2010.